The VWR 1545 General Purpose Laboratory Incubator offers you excellent uniformity and recovery without hot spots. This general-purpose incubator features heating elements positioned at the bottom, back, both side walls and the door, creating a jacket of warm air and giving you the advantages of a convection or gravity oven but minus drying or cross contamination. Heating elements in this lab incubator are completely sealed off, and safely away from the work chamber. The VWR 1545 Incubator is microprocessor controlled, with a digital display, and user friendly interface. 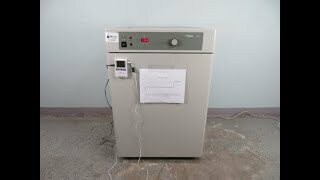 The over temperature safety controller of this lab incubator can be set by the user and helps protect samples in the event of the main controller failing. To maintain the environment, a tempered glass door allows users to monitor samples. The interior and shelfs of this lab incubator is constructed of corrosion resistant stainless steel, with through wall access for chart recorders and an interior accessory outlet for instrumentation not exceeding 1 amp. 25 x 28 x 38 in. This VWR 1545 Incubator has been thoroughly inspected and is performing beautifully. All of our lab equipment comes backed with our standard warranty. Should you have any questions about this or any of our other incubators, please don't hesitate to contact us.